What Future do we want? How will we get it? 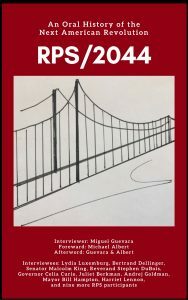 One possible answer can be found in the book RPS/2044 – an oral history of the next American Revolution as sought – and won – in an alternative version of the U.S., time-shifted from us 25 years forward. This site provides tools to discuss, elaborate on, and add to the insights of the 18 interviewees and the interviewer, Miguel Guevara, who recount their future. 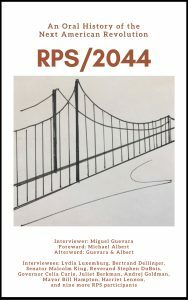 RPS/2044 reports the future by looking back from roughly 2041 – and a little forward, to 2044. It is an oral history of a project to create a new society on an Alt Earth, in an Alt United States. 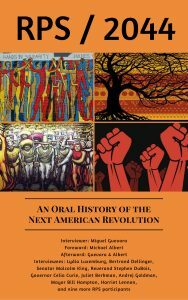 The interviewer, Miguel Guevara, brought questions to eighteen interviewees and used their answers to construct thirty chapters he disseminated electronically in 2042. In 2017, however, from our vantage in our present, RPS/2044 addresses a possible and hopefully inspiring but certainly not inevitable future. It reveals possibilities and insights meant to provoke discussion and exploration of our own possible futures. The main substantive offerings on this site are the front matter, the 18 source interviews from which the book combines excerpts into chapters, and even three of those chapters. This is all linked from the vertical menu on the left. 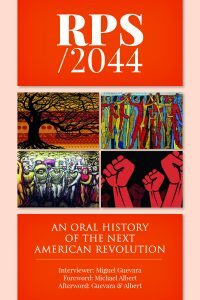 The interviews were transcribed verbatim from sessions with Miguel Guevara in 2040-2041. By way of the horizontal menu above there is also material on the interviewees that includes a way to submit questions to them which will within a few days of being sent appear on site, followed by answers from the interviewees. There are also links for reviews and testimonials, and for purchasing the book, should you wish to do so, once the book is actually published. Unusually, we also provide an audio/video playlist to accompany the book. The list appears in the Foreword, as text but also here on the site as links to video performances. For viewing/listening now, use the page titled Playlist, linked also from the top hozizontal menu. Trust us a bit on this – the list is rich and the videos are inspiring, but it does take time for the age to load. Finally, also in the horizontal menu across the top there are two more links – for forums and blogs. The forums are a tool to make it easy for you to comment on or react to any part of the interviews, and later the book, and for interviewees and others to reply, as well as for us to hopefully incorporate your insights into the first and then future editions of the book. The blogs allow you to offer more substantial essays, should you wish to. Or, you might even decide to write a story or stories, more novelesque than its oral history, about the RPS project. To post a blog, however, you will have to register/log in and then use the + sign in the menu in the black band st the very top of each page. In light of all the above, we clearly have an unusual experimental site to go with an unusual experimental book. Try any links, however you choose. Participate as much as you desire. By the way, the covers that displayed here were propsed, subject to change, like everything else about this endeavor. Comments on them or anything else, are welcome.